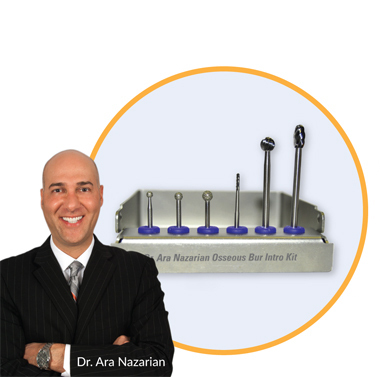 The Dr. Ara Nazarian Osseous Bur Intro Kit from GlodenDentTM is clinically designed and tested by Dr. Nazarian to effectively and predictably level and shape bone and to remove unwanted granulation tissue in preparation for dental implants and/or dentures. The Intro kit also contains a highly effective cutting bur for sectioning teeth, to make a "purchase point" for forceps beaks or to engage root tip picks, as well as to decorticate the bone or demarcation when ridge leveling. The proven solution to save you time & improve your bone leveling and granulation cleaning process! Extended friction grip burs designed to precisely and effectively remove unwanted tissue without grabbing or damaging the surrounding bone to ensure no interference with the graft material. Easily remove tissue from extraction site socket that may be different to achieve(or access) manually with a surgical curette instrument. 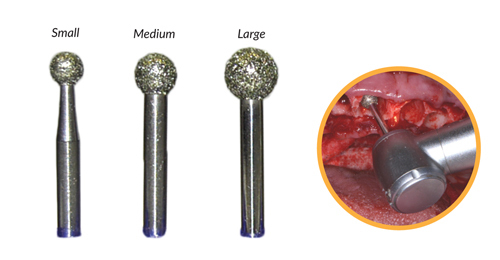 Round and football shaped carbide burs designed specifically to effectively and predictably level and shape bone at the ideal width, shape and size in preparation for dental implants and dentures; and long shank design allows for proper and easy connection for straight nose cone hand piece.